You will be given a reference e-book to read which has 175 pages And the test will be based on that e-book , you can take the test after 10 days Of purchase. Small and midsized organizations represent 80 percent of the value stream, so if they are not working to their full efficiency, the loss is not only theirs. Contrary to conventional thinking, six sigma can be successfully implemented in these organizations only difference being the way it is implemented. This course has been developed by experienced six sigma professionals to help those associated with small and midsized organizations in successful six sigma implementation, as standard six sigma deployment protocols are beyond the reach of these industries. This course focuses on avoiding inconsistent, ambiguous generalizations of six sigma, especially in small and midsized organizations. This course includes lessons on six sigma deployment in small and midsized agencies aiming at practical implementation roadmap, including knowledge about critical success factors such as leadership, strategy, planning, deployment, and execution. Many of such organizations are also waking up to the value that other courses like Six Sigma business improvement certification can bring in and are looking to employ people with these skills. Scalable six sigma framework for successful six sigma implementation in small and midsized organizations for quicker returns. Practical and detailed application of DMAIC methodology. Benefits of administrative and support functions in six sigma deployment. Focus on strategy deployment and project selection models. While developing this course, every effort has been made to provide a six sigma implementation strategy in the small and midsized organization. Particular focus was on providing the leadership, strategy, implementation, planning, deployment, execution, integration, alignment, soft-side Six Sigma, and performance measurement issues that are universal to all organizations and shows how these can be applied successfully in small and mid-size organizations. Associated with small and midsized organizations.Even those who have a marketing executives certification and looking to open their enterprise can benefit from this course as it deals with all issues that a small or mid-sized organization can face and their solutions. Brainmeasures Mastering six sigma in small and midsized organizations course and certification program is a one of its kind online six sigma implementation program. Tailor made to perfectly fit in the small and midsized organization working scenario, no other online certification company is offering this program, and once you get certified in this field, substantial job opportunities will open up for you as these industries have realized the importance of six sigma but skilled professionals are very few. 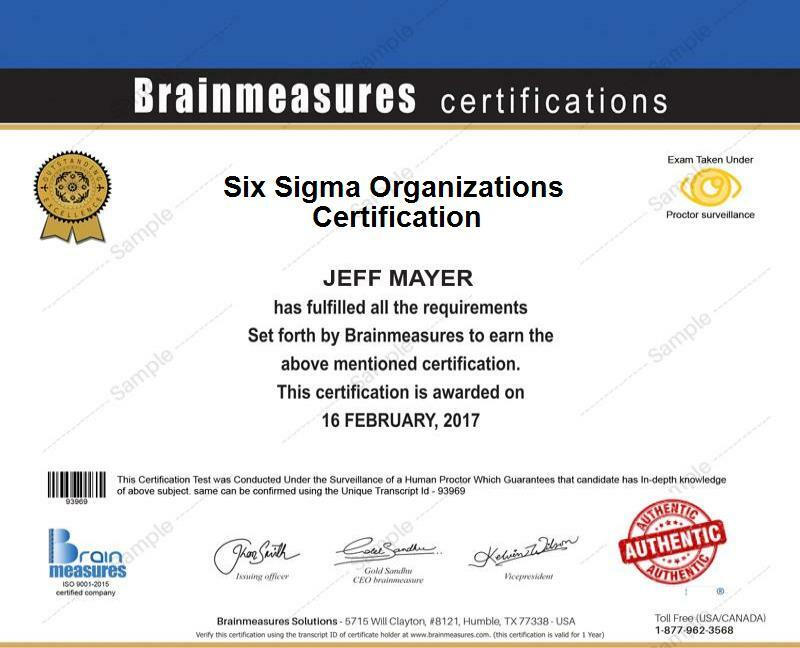 Brainmeasures mastering six sigma in small and midsized organizations course and certification program is worth every penny spent on it, take this certification to give a new dimension to your career and organization.